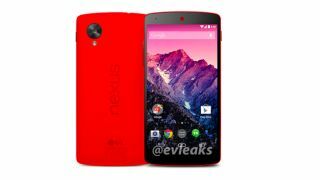 The rumoured red edition of the Google Nexus 5 appears to be a step closer to reality following the leak of an official-looking press render. Following multiple blurry-cam and unboxing leaks over the last couple of weeks, that man @evleaks appears to have gotten hold of the best look yet. The images shows the device with a red rear casing and earpiece, but the faceplate itself retains its black bezel. The Red Nexus 5 has been tipped to launch on February 4, following the leak of an internal document from U.S. network Sprint. The Nexus 5, crafted by LG and and also available in black and white, has been a big success for Google, continuing its growing hardware momentum. It was Google's best-selling device of the last quarter with the company citing "very strong" sales in last week's earnings call. It has proved an attractive option for smartphone because of its agreeable price-point compared to handsets like the Samsung Galaxy S4 and HTC One. Nexus 5 has also proved popular among Android enthusiasts who value the raw version of the software and the immediate updates when Google refreshes the operating system.